Brazilian media are analysing reports that President Dilma Rousseff has offered her predecessor in office, Luiz Inacio Lula da Silva, a post in the cabinet. Many comment on the fact that taking a job as a minister could shield Lula from prosecution on recently filed money laundering charges. Under Brazilian law, cabinet members can only be investigated, charged and tried by the Supreme Court. A federal judge would therefore not be able to touch Lula should he decide to hear the case. 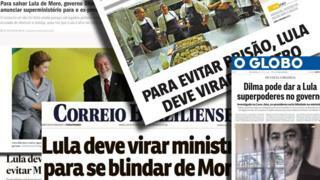 Right-leaning magazine Veja reflects this in its headline: "To save Lula from (Judge Sergio) Moro, Dilma's government is on the verge of announcing a super-ministry for the former president". But centre-right newspaper Estado de Sao Paulo does not think a cabinet post would necessarily protect Lula, pointing out he could still be tried by the Supreme Court. In its article it quotes Supreme Court Justice Marco Aurelio Mello, who said that there were no guarantees that the Supreme Court would be "benevolent" towards Lula. Right-leaning O Globo says that Lula's greatest challenge will be to convince the public that he is not just accepting a cabinet post to avoid possible prosecution by Judge Moro. Daily newspaper Correio Braziliense argues that having Lula in her cabinet would benefit President Rousseff, who is facing moves to impeach her over allegations she manipulated Brazil's account books to hide a growing deficit. Its headline reads: "Lula is the last chance for President Dilma to escape impeachment". It argues that Lula could use his influence with members of Congress to get enough of them to vote against impeachment. Centre-right newspaper Folha de Sao Paulo thinks that Lula will drive a hard bargain and demand guarantees that the government's economic policy will change before he accepts a cabinet post. Brazilians have been expressing their views on Twitter. Several hashtags have emerged reflecting the deep divisions among them. The most popular have been #LulaMinistro (Lula Minister), #ForaDilma ("Dilma Out") and, in reference to Judge Moro, #Somostodosmoro (We are all Moro). Twitter user Roberto Silveira (@btpsilveira) welcomed reports of Lula's possible new post, alluding to what some see as a right-wing campaign against the former leader: "#LulaMinistro because we have to respond intelligently to brutality and fascism". Guily (@guibomeny), on the other hand, was critical of the planned move to make Lula a minister. Guily tweeted BBC World and BBC News saying: "The most corrupt man in the world will receive a ministry to escape justice! I'm so ashamed of my country! #lulaNaCadeia" (Lula in prison).